Now that my forge is up and running I have quickly come to the realization that my puny anvil isn't cutting the mustard. And as usual, can't seem to find $2400 to spend on a new 300 pound anvil. After doing a bunch of reading on the subject I am liking some of the post anvils I have seen. These appear to be well suited for forging knives. 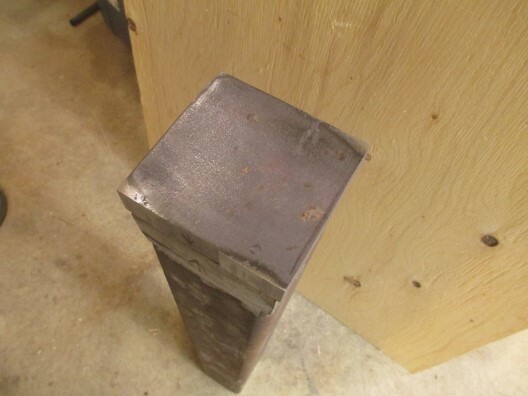 My goal here is a useful post anvil and my budget is $100. Sources of free to inexpensive steel are the places to go to. My local dump (the guy lets me take stuff as I am a "repurposer"), the junk yards, steel recyclers etc. I am going to be visiting the dump right away. 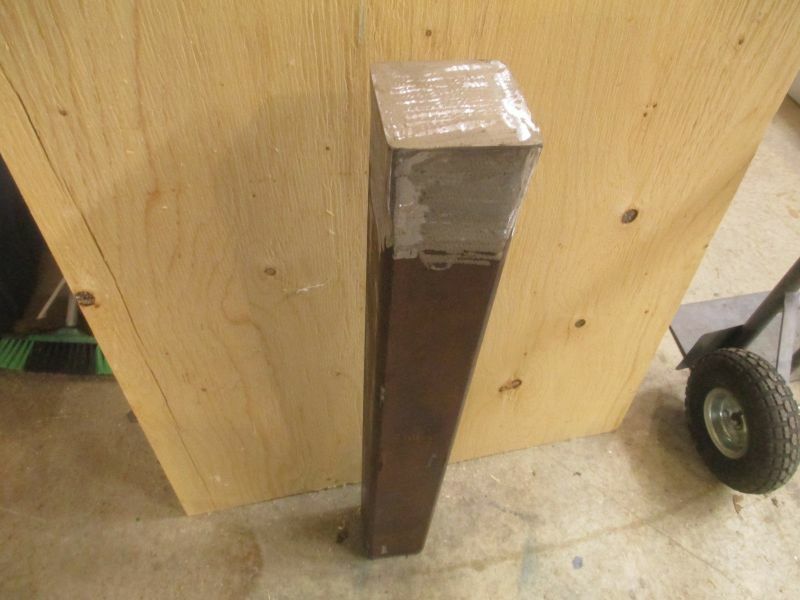 I found this piece of 4" Hollow Structural Steel (H.S.S) that has a 1/4" thick wall. It's a bit rusty, but should make the start of a solid base. I cut it nice and square at 30". I guess some old 4, 5 or 6" diameter schedule 40 or 80 pipe would work just as well. This rusty old piece cost me $0 at the dump. 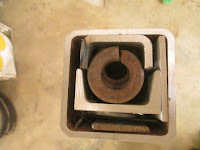 Here I have welded a cap on the bottom. 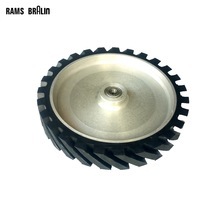 It's made of 3/16" mild steel. 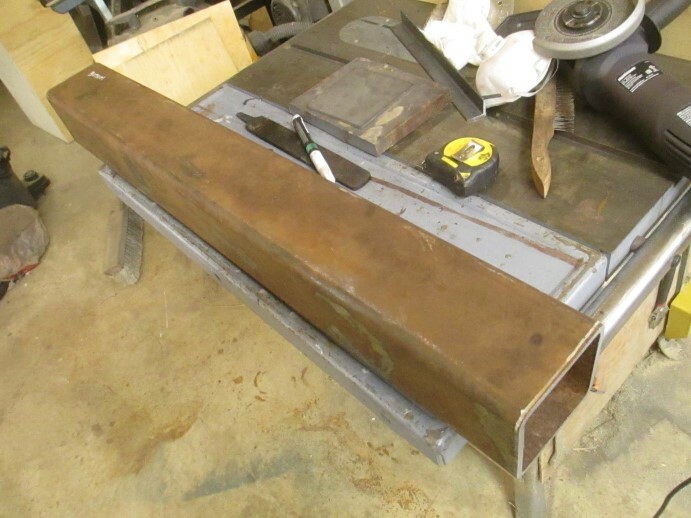 I have also cut a length of heavy duty 3" C channel to just under 30". The C channel fits inside the HSS and it just a little taller. I will grind this down to flush later when I weld the anvil face on top of the post. 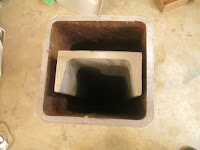 Now I am on the hunt for anything steel to put inside and fill it up. 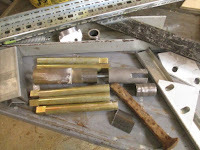 I have scrap steel of all types and shapes. In addition to the C channels, I have packed the scraps in. Including old nails, washers, baling wire and screws. If you have some reinforcing bar lying around, cut it to lengths slightly longer than your hollow. These will be ground down to flush later. 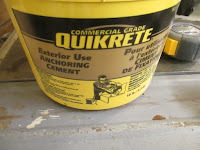 The mortar I am using is meant to be poured. It doesn't contain aggregate (stones) and has compression rating of 7,000 psi (48.3 MPa) @ 28 days curing. It is also described as "expanding" which should hopefully fill all the voids inside when it is poured. Sold as QUIKRETE Commercial Grade Anchoring cement. I know there is stronger stuff out there. Shop around. We're looking for "flowable" and "high strength." Mixed 5:1 with clean water for a pourable mixture. 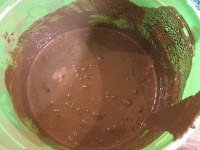 I mixed it all in three small batches. And in it goes. At this stage I am guessing this weighs over 100 pounds. 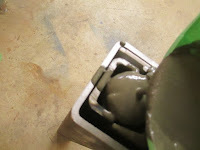 As this cures, I will have some time to hunt for scrap to build the anvil face. I've waited 33 days now. 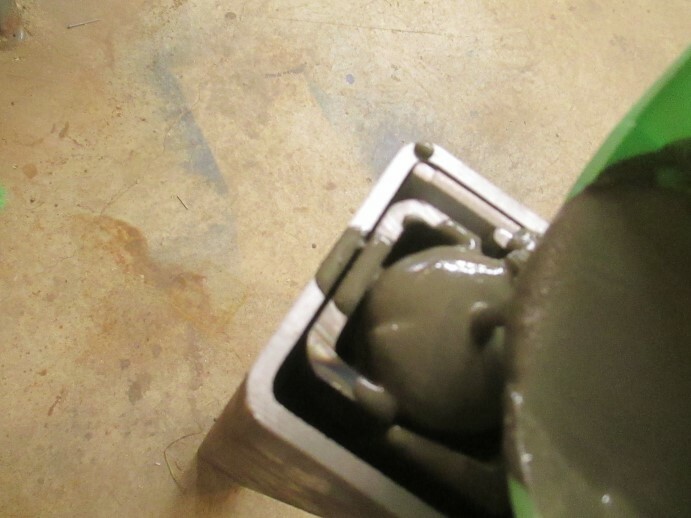 According to the product literature the cement should be reaching the 7,000 psi compressive strength. Time to put the top on the anvil face. 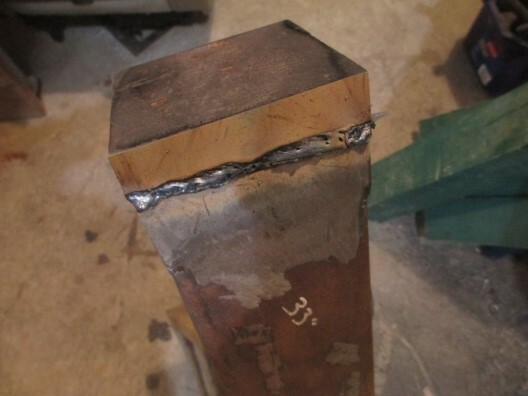 My main steel cap is 1-1/4" thick and two pass seam welded all around the perimeter. Then ground back to near flush. Next the anvil face is a 7/8" thick carbon steel from a tie plate. 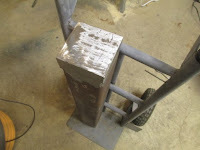 Beveled and welded all around, first pass. After some work with the angle grinder it's ready to test. 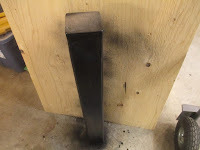 A shot of flat black high-heat paint and we're ready to make the base. Looks great. Can't wait to see it finished. Dan, looking to make something similar, how is your post anvil treating you? Did you use hardenable steel for the face? Hi Chris, the face is carbon steel, I think it's 1060. 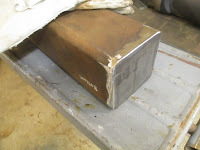 Others have surfaced low carbon steel with a hard welding rod and ground that nice and smooth.